In the previous bearing article we discussed the importance of using quality bearings and where to find them. In this installment I’ll explain how to decode the numbering system currently used in rolling element bearings and provide some installation tips. To understand why different bearings are used in different locations on our bikes first we need to understand how fast the bearing is going turn and how much of a load it’s expected to support. Bearing loads can be applied in the radial direction or perpendicular to the bore of the bearing. Bearings can be loaded in the axial direction, commonly referred to as thrust which is parallel to the bore of the bearing or a combination of radial and axial loading referred to as angular loading. Cylindrical roller bearings and their smaller cousins the needle bearings have a high radial load capacity but offer no thrust loading. 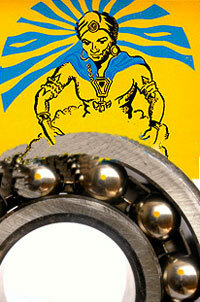 These bearings are usually used in conjunction with a deep groove Conrad style bearing such as on transmission shafts. Deep groove or Conrad type bearings offer good radial loads and some thrust or axial loading such as the main bearings. Angular contact bearings offer a combination of high radial and axial loads and might find use as a main bearing behind a helical gear to handle the thrust load. A flat or thrust bearing offers excellent axial or thrust load capacity but almost no radial load capacity. Examples are found in the pre 1975 Maico steering heads. Last but certainly not least is the tapered roller or Timken bearing as it is commonly referred to. These “cup and cone” bearings sport a high radial and axial load capacity and are commonly found in the steering heads of most motorcycles. The last 2 numbers are for calculating the bore size of the bearing. Simply multiply the last 2 numbers by 5 and that will give you the bore size in mm. 05 X 5 = 25mm bore. Here’s where it gets a little dicey, the letters and numbers that follow the first 4 differ from one manufacturer to the next in this case “2RS” means this bearing has 2 seals installed. No simple or commonality amongst bearing manufacturers here, whether the bearing has shields, seals, brass, steel or resin cages it’s all different and you’ll have look it up for your particular bearing. See link at end of article. By now some of you that are familiar with bearings are going “Hey wait a minute what about this C3 stamped on my bearing?” Most all non-separable rolling element bearings are designed with an internal clearance between the races and rolling elements. Although very small this clearance is vital to the life of the bearing. Typical internal bearing clearance is measured in tenths of thousands of an inch, .0001”. When a bearing is pressed onto a shaft with the proper interference fit, app 80 percent of the internal clearance is removed by the expanding inner race. On a 25mm bore bearing this can mean that all you have left over for thermal growth and lubrication after installation is ½ of one ten thousands of an inch or .00005”. If you removed a C3 bearing make sure you install a C3 bearing in its place. If you install a tighter clearance bearing you can remove all the internal clearance and now you’ve got a new bearing that is doomed to an early death. Bearing clearance classes are typically designated C1 to C5 with C1 having a tighter than normal internal clearance and C5 being at the loose end. If there is no clearance or “C” designation on the bearing it is considered to be a C2 or normal internal clearance bearing. The faster and hotter a bearing runs the greater the internal clearance required. OK now the fun part, you’ve disassembled, cleaned and inspected your engine and have all the new parts and tools required for reassembly laid out ready to go. Just as important is to have a relatively clean area to assemble your engine. If you’re using the welding/grinding area of your garage for engine reassembly best to go elsewhere. If you are going to use your wife’s prized antique dining room table, a piece of old carpet will help keep your relationship intact…maybe. Prior to installing your new bearings make sure the bearing fits are clean and free of burs or nicks that could preclude the bearing from being seated to the proper depth. Do Not remove the bearing from its sealed package/wrapper until you are ready to install it. Anything above 300 degrees F. can start to change the grain structure of certain metals. If and I say IF you have a reliable way to measure AND control temperature 275 degrees is OK. The idea is to stay away from that magic number of 300 F. Heating engine cases or bearings with a torch is the least preferred method; an oven, hot plate or bearing heater is the best way to go. The goal is to have even heating throughout the whole case or bearing. Press; do not hammer the bearing in place. Press ONLY on the fitted bearing race until seated in its bore or against the shaft shoulder. This would be the outer race if the bearing is going in a case half or the inner race if it’s going on a crankshaft. Before you install the bearings make sure you have the correct size bearing driver/s on hand or in most cases a properly sized socket. If you have to remove a bearing by pressing on the non-fitted race the bearing is shot, throw it away and do not re-use it. A couple of great tools for bearing installation are a small arbor press (preferred) or a small “C” frame hydraulic press and a small oven. I use a hydraulic press but prefer the arbor press for its better feel. If you use your household oven to heat engine cases or bearings make sure they are really clean otherwise every time your wife cooks a pot roast it’s going to smell like you’re following an old Ford with no piston rings down the road. It’s that intact relationship thing again. It’s not rocket science and with a little forethought, patience and a few tools anyone can install bearings like the pros. Lots of good bearing info on the web, a few good sites are included below.